Over the years I have done humanitarian work in connection with a number of countries and world issues. I'm one of those crazy people who, for better or worse, tends to concern myself more with others' welfare than my own. In our time, this is a strange disease and rather infectious. This is not standard humanitarian work through NGOs and aid organisations. I work independently and close to the ground with real people and situations, either in the field or online from home, and I have a spiritual-political viewpoint that doesn't chime so well with big organisations and official policy. But then, while it means I don't get paid for it, it frees me up to do things in the way I best can, evolved over four decades. I'm committed to peace, conflict-resolution, post-confict social reconstruction, and recording and networking people's situation through writing and photography. Some of the methods I use are distinctly spiritual and, some people would think, 'weird' - including water divining, earth-healing and laying-on of hands healing - and that's why I don't work for Oxfam or UNHCR. I'm not aligned with any political or religious grouping - except humanity, towards whom I seem to be thoroughly biased and partisan. My main aid activities are helping people by offering clear ideas and counsel, problem-solving, personally supporting community leaders and peacemakers, helping educational and empowerment projects and doing outreach work for them. I've done this mostly in Palestine and also in a number of other countries and contexts. In the 1960s it became clear to me that the world would not progress unless we had peace, and I needed to do something about it. I got involved with student radicalism when at university, at the LSE. By late 1974 I was as a result a refugee in Sweden where, becoming an English teacher, I worked on a friendly basis with other political refugees, helping them deal with their trauma - Argentinians, Chileans, Lebanese and Greeks, for example. Some were British soldiers who had deserted the army in Northern Ireland and some were American draft-dodgers too. Then in the 1980s, with a number of fighters in Northern Ireland who had had second thoughts, I helped them leave their profession and restart their lives. This happened because I was an astrologer. A man contacted me and, in the session, gave no details at all about his life. His vibe was a bit strange, but he seemed okay. He was relieved with what I told him and, later, he passed another client to me. Only with the third did I realise what was happening - they were fighters pulling out. They'd seen the light. It was nine of them altogether, over a few years. In the 1990s I wrote a lot about the Bosnia and Kosovo conflicts, did online work to muster support. I also supported activists in carrying out their own work in those then-conflicted countries. In 1995 I founded the Hundredth Monkey Project or M100, a large-group summer-camp venture doing spiritual work and 'inner aid' in relation to world crises at the time - everything from the Bosnia war to Amazonian forest fires, the ozone layer and French nuclear testing. This continues today, 20 years on, with the Flying Squad. Following this, together with two UK colleagues, Pam Perry and Tom Clark in Glastonbury, UK, I got involved with the Middle East, raising funding and support for spiritual peacemakers in Palestine and Israel. We later co-founded and worked with Jerusalem Peacemakers, together with the late Sheikh Bukhari, Eliyahu Maclean and Ibrahim Abu el-Hawa from Jerusalem. 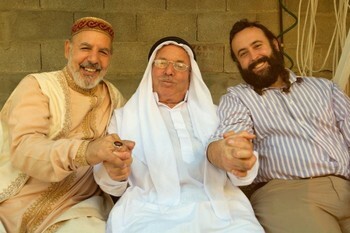 Jerusalem Peacemakers is now called the Abrahamic Reunion. I then got involved with the Hope Flowers School in Bethlehem, Palestine, a school and adult education centre focusing on trauma recovery and social reconstruction. I spent a lot of time there, helping the school with outreach, problem-solving and support for its overstretched management and staff. 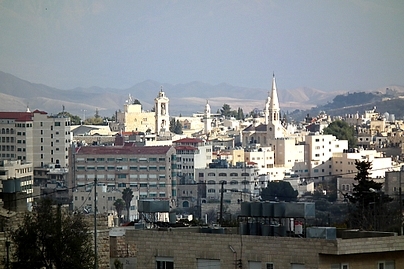 I also worked with other people in Palestine, and this story is told in a book of mine called Pictures of Palestine - a humanitarian blogging from Bethlehem. and supporting a small desert Tuareg village called Tinzibitane Elabdach, near Timbuktu, Mali - more about the Tuareg here. These are nomad herders who have been severely affected by drought and a jihadi war in Mali a few years ago. The current project (2017) is to fund the founding of a school in the village. I do counselling, strategy advice, photography, websites, writing and editing outreach material for peacemakers, social leaders and activists. Also I have worked with peacemakers and social activists in Syria, Chechnya, Kurdistan and Palestine, and in my home country of Britain. I do this online or in their own countries. This is all about peacebuilding and post-conflict psycho-social reconstruction, and supporting good souls doing good work for humanity. That doesn't always mean that governments and the media like a person like me, even though my work falls under the heading of 'anti-terror'. This is the way of things and I carry on anyway, doing my best for real people in the best way I can. Being an editor by trade I'm also involved with online mentoring of young people in Gaza, helping them write their interesting stories for international consumption, with the NGO We Are Not Numbers. So, as you can see, I've been a wee bit busy, and it's not quite finished yet - it never actually ends! If you're interested, there's more on this site, notably about the Tuareg in Mali and about Palestine and the Hope Flowers School. Or if you'd prefer, here's a good yarn about the day I first visited Hebron in the West Bank of Palestine. Thanks for reading. And hey, I'm not so special: you could do something like this too. All you need to do is find a friend in a developing country that you have a feeling for, start talking, and it starts from there. There are thousands of us. But the media tend not to talk about us, so we just get on with it anyway.